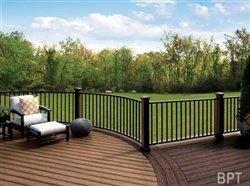 Railing can upgrade any deck from drab to fab – adding style, as well as safety and support. In fact, it’s often the one element that truly sets your outdoor living space apart from others in the neighborhood. Here are five steps to create the perfect perimeter for your deck. 1. Find ideas at your fingertips – From contemporary to classic, you can choose from a multitude of modular railing options in a variety of colors and materials to give your outdoor living space a dose of personality. Use the new Railing Configurator on the Trex Color Visualizer iPad app to experiment with more than 1,200 design combinations. Available for free in the Apple iTunes store, the app allows you to virtually mix and match posts, caps, rails and balusters, as well as change the backdrop to emulate your own outdoor living environment. Save images of your favorite designs and automatically generate a list of materials to make the purchase process easier. 2. Select low maintenance materials – When choosing railing, demand the same durability and high performance that you expect from your decking, so that you’ll be able to spend more time relaxing on (rather than maintaining) your outdoor living space. Unlike wood, composite railing won’t warp, rot or splinter and never needs sanding, staining or painting – even after years of exposure to the elements. In fact, it washes clean with only soap and water. 3. Preserve a picturesque view – Whether your deck looks out over a tranquil lake, a dramatic mountain range or just a meticulously landscaped backyard, the proper railing makes it possible to fully enjoy your vantage point. With its sleek and unobtrusive appearance, Trex Reveal Aluminum Railing maximizes scenic views by spanning long lengths for panoramic sightlines. Available in three neutral colors – charcoal black, bronze and classic white – Trex Reveal can be customized to suit the taste of any homeowner with two baluster options (square and round) and two post choices (aluminum and composite). “In addition to highlighting the beauty of your outdoor surroundings, aluminum railing offers unparalleled strength and features a powder coating that resists corrosion and color fading,” says Adam Zambanini, vice president of marketing for Trex, the world’s largest manufacturer of wood-alternative decking and railing. “For ultimate peace of mind, Trex Reveal is also backed by a 25-year limited warranty.” For more outdoor living tips and ideas, visit www.trex.com. 4. Look to regional style trends – While personal taste is the biggest influencer when selecting railing for an outdoor living space, many homeowners look to the architectural styles of their particular regions for inspiration. For instance, on the East Coast, traditional colonial style balusters and crown profile railings remain most popular. However, West Coast homeowners tend to prefer sleek and streamlined railing components – including handrails and bottom rails with more contemporary beveled shapes. To learn about trends specific to your area, flip through a locally published home improvement or home decor magazine. 5. Lighten up – Enhance the beauty of your railing and lengthen the time you can spend enjoying your deck with outdoor lighting that may be installed on rails and post caps. Not only will lighting set the mood for evening cocktail parties and al fresco dinners, but it also will add safety and security. Consider LED dimmable options to maximize energy efficiency.